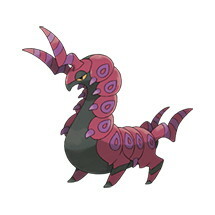 This page contains the Pokedex Data for Scolipede, including base stats, type defenses, abilities, evolutions, move list and location in the games. Poison Point The opponent has a 30% chance of being induced with Poison when using an attack, that requires physical contact, against this Pokémon. Swarm When HP is below 1/3rd its maximum, power of Bug-type moves is increased by 50%. Speed Boost Speed increases by one stage at the end of each turn.